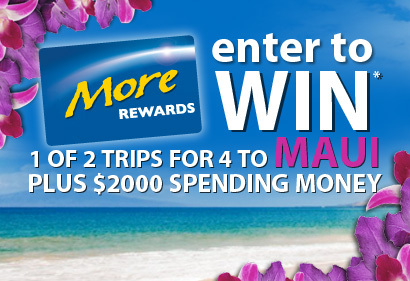 Enter to Win* 1 of 2 trips for 4 to Maui plus $2000 spending money! The contest is only open to residents of Canada, excluding Quebec, who are the age of majority in the province in which they are resident at the time of entry. To be eligible to win a prize in this Contest, you must be a More Rewards cardholder. Starting October 1st until December 15th 2012 visit MoreRewards website for your chance to win one of two 6 night trips to Hawaii for 4. Trip includes four (4) roundtrip flights courtesy Alaska Airlines from Bellingham WA. to Maui and a six(6) nightstay at the The Whaler premium luxury resort on famous Kaanapali Beach. 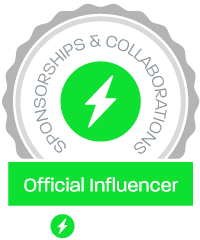 Plus receive $2000(CDN) spending money from More Rewards. Approximate retail value $6500(CDN). Enter the contest online at www.morerewards.ca (or at the step 4 in the instructions below). Earn 1 entry by registering your email address for a chance to win the Alaska Airlines Maui, Hawaii contest (the Contest”). Create, update and/or confirm your More Rewards Online Account information and you will automatically receive 10 extra entries. Earn More entries by using Vouchfor! Vouchfor enables you to refer your friends. For every friend that enters the contest you earn an extra 5 entries. You can refer friends through email and social media. Click the image below to get 5 extra entries to Alaska Airlines Maui, Hawaii Contest! 1. Click the image below to start. 2. After you click on the image below, you’ll be able to get your contest voucher, by clicking the “Click here for your voucher” button at the top of the page. You’ll be able to view your voucher number on your screen or in the automatic email you will get in your inbox. 3. Redeem your voucher. Go to http://redeem.referralfor.com and enter your voucher number to redeem it. 4. Sign up for the contest, in case you did not do that already. After you redeemed your voucher, on the next page you’ll see a link to signup for the contest. *No purchase necessary. Must be age of majority. Contest details are subject to change.